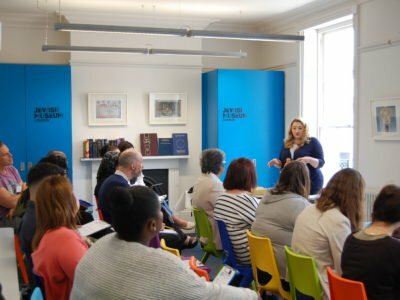 Intensive in-service courses are available for teachers and trainee teachers covering subject knowledge, issues of planning, delivery and assessment of religious education, Holocaust education and the topic of immigration. You can bring your team to the museum for an INSET day and the Learning Team will design a seminar to fit your needs. Activities include a tour of the museum galleries, object handling and the importance of objects as springboards to discussion. There is also the chance to ask your questions about Judaism, what it means to be Jewish today, and teaching about immigration and Holocaust. We can guide you on creative ways of delivering your syllabus and methods on how to use museum workshops and resources to achieve quality learning. Please note that all workshops must be booked in advance.